John Locke was an English philosopher and physician, often considered as one of the greatest and most influential Enlightenment thinkers in history. Born in Somerset, England on 29 August in 1632 to Puritan parents, John Locke’s father was a prominent country lawyer and his mother was Agnes Keene. He was raised in a rural house in Belluton, Somerset. Locke attended the famous Westminster School in London where he studied Latin, Greek, Hebrew, Arabic, mathematics, and geography. In 1652, aged 20, he was admitted to Christ Church, Oxford where he studied the works of philosophers such as Francis Bacon and Rene Descartes. He obtained a bachelor’s degree in 1656 and a master’s degree in 1658. Later, he also received a bachelor of medicine degree in 1674. Locke took a position at Christ Church College, Oxford in 1663 and was introduced to Lord Anton Ashley Cooper (later known as the 1st Earl of Shaftsbury) in 1666. The following year he became his aide and personal physician. He became a fellow of the Royal Society in 1668 and undertook medical research. Additionally, Locke helped draft “The Fundamental Constitutions for the Government of Carolina” in 1669. In 1675 he moved to France and remained there for four years, spending most of his time in Paris and Montpellier. Locke returned to England in 1679 but due to political turmoil over the succession to the throne, left for Holland in 1683. He remained there for five years returning to England when James II was overthrown and William of Orange and Mary came to the throne. He then lived with a friend in Essex until his death. John Locke is widely considered to be one of the greatest English philosophers and a leading figure in the fields of epistemology, metaphysics, and political philosophy. He also made crucial contributions to education, theology, medicine, physics, economics, and politics. Locke’s empiricist epistemology (he was the founder of empiricist theory of knowledge) inspired Berkeley, Hume, and the later years of empiricism. Locke’s political philosophy is often noted with shaping both the American Constitution and the French Revolution and laid the groundwork for liberal political thought. He was the first person to explain the self through a continuity of consciousness. He proposed that the mind was a blank slate or tabula rasa. His most noted work is “An Essay Concerning Human Understanding”, a four volume work, was published in 1689. It provides a thorough account of how we acquire everyday, numerical, scientific, religious and ethical knowledge. He published “Two Treatises of Government”, a work of political philosophy, in 1689 anonymously. The First Treatise attacks the concept of absolute power for the monarchy (patriarchalism) and the Second Treatise summarizes Locke’s views for an ordered society, reconciling the liberty of the citizen with political order. 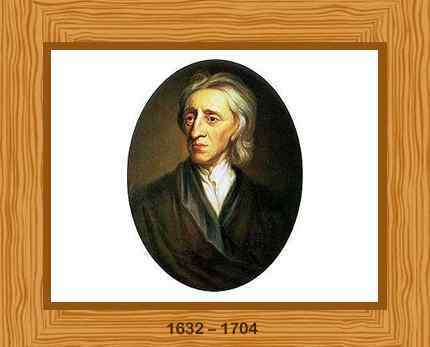 Some of the Locke’s other most noted works are “Essays on the Law of Nature”, “Some Thoughts Concerning Education” and “A Letter Concerning Toleration”. His 1695 publication “The Reasonableness of Christianity” is considered to be his most important theological work in which he argued that differences of worship could and should be tolerated. Locke never married in his lifetime. He died in 1704 at the age of 72. He was buried in the churchyard of the village of High Laver, Essex.